Welcome! Come on in and make yourself at home! I am so thrilled to be a part of the second book in the Moda Bake Shop series along with all the other super talented Chefs in our industry. If you already own the first book, Fresh Fabric Treats, then you know the variety of projects they contain and how great these books are. I would like to take just a second to give a HUGE THANK YOU to Moda Fabrics and Stash Books for putting together these creative and inspirational books of joy. My contribution in the Sweet Celebrations book has to do with Graduation. It is a quilt that every high school or college student would love to receive and share memories with their friends. It would also make a fantastic gift for a special teacher from all her graduating students. To see a picture you will need to buy the book... I know the suspense! But, I am sure you will love it and find even more uses for the design such as a new baby, birthday, family reunion, or simply for a special friend. Do you prefer to celebrate with cupcakes, cake pops or just plain old cake? Cupcakes all the way! Love me some cupcakes... currently trying to find an excuse for me to get some cupcakes just cuz they are so good... OH WAIT! A new book... perfect excuse for some cupcakes. LOL! I actually eat my cupcakes in a different way, less mess from the frosting but you still get to enjoy every last crumb! Check back Monday for my special cupcake eating technique... I promise you will start eating your cupcakes this way too once you see it. When you picture Oda May, what does she look like? In my mind, Oda May is a classy, timeless gal that doesn't take crap from anyone. She is tough but also as sweet as can be. She is the cream of the crop! 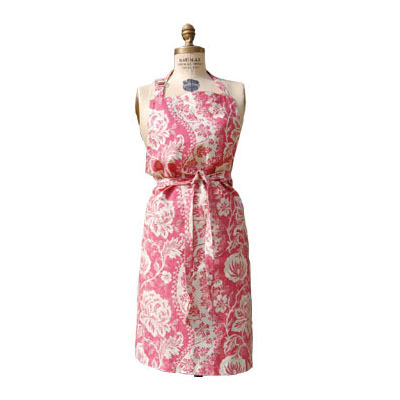 Tell us about your favorite apron. I don't wear too many aprons, but when I do, I really like the butcher style aprons, bib and half. Being a tall girl, I like the length and the extra long straps so you can cross in the back and tie them in the front. My favorite apron is actually the French General Rural Jardin Butcher Apron that was sold a couple years ago. How do you press your seams? I prefer to press my seams all to one side. If I am topstitching then I generally press in the direction that I will be doing the topstitch so it holds the seam down. If I am working with heavy fabrics mixed with light weight cottons, then I will press the seams in the direction of the lighter weight cottons to help reduce the bulk. 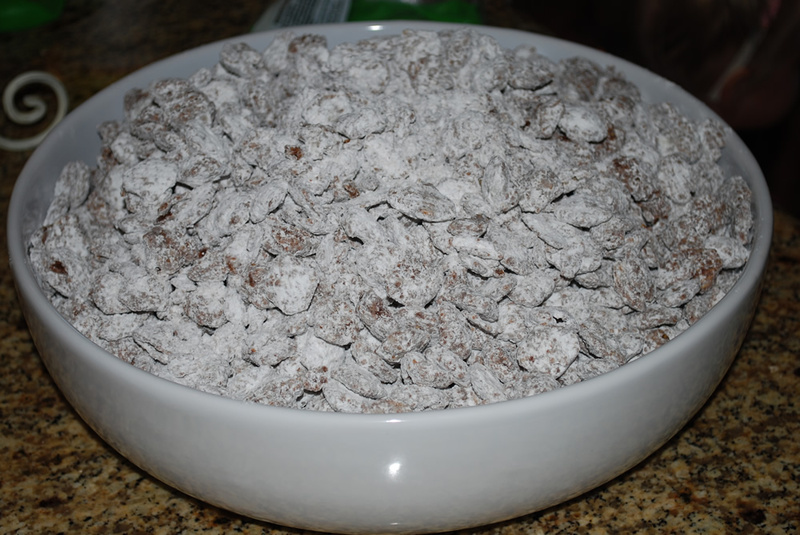 Every celebration, whether it be birthdays, Christmas, Halloween, or just simply for a family gathering, my neices and nephews always have one special request... "Aunt Angela, will you please make your puppy chow??" Who could say no? 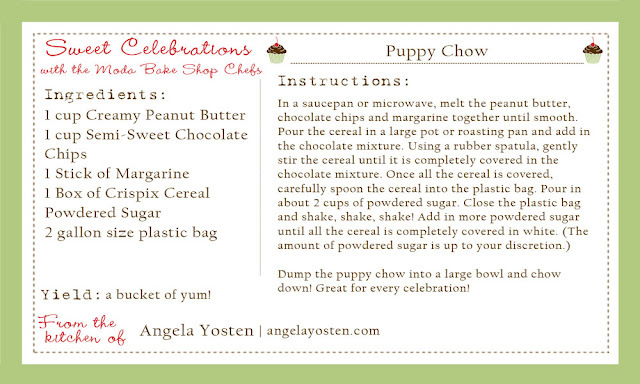 So, today I am sharing with you my childhood favorite... Puppy Chow. If I can remember correctly, the original recipe for Puppy Chow was published on the Kellogs Crispix cereal box. Now for the celebration part of the post... did somebody say GIVEAWAY!?! 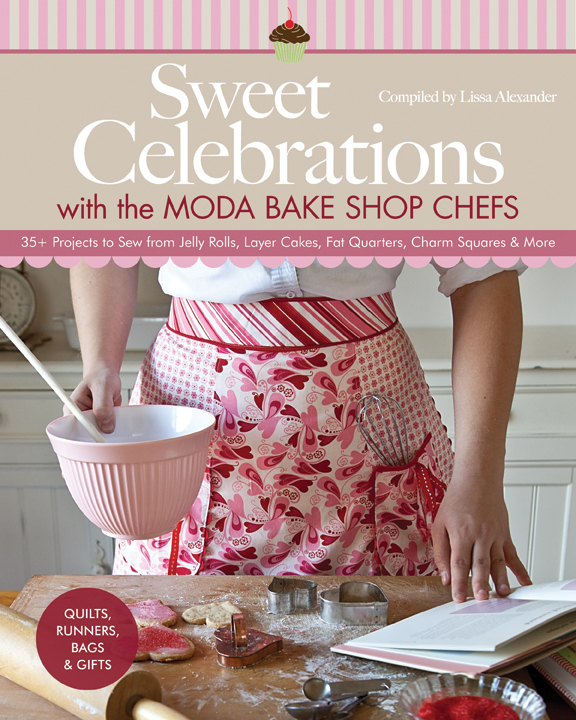 Stash Books is giving one lucky reader from my blog a FREE copy of the Sweet Celebrations Book. Moda Fabrics is also adding to the loot one of my favorite precuts! Although, I like them all the same, I have chosen a Layer Cake as the giveaway on my blog. Layer Cakes are so versitile and can be cut some many different ways or simply used as is. Simply leave me a comment. That's it. If you are having a bad hair day, I would love to know. LOL! P.S. - For a bonus entry, "Like" my page on Facebook and leave me a comment that you have done so. P.S.S. - For another bonus entry Follow my blog and then leave me a comment that you have done that too. P.S.S.S. - Have a SWEET weekend and be sure to check out all the other fun celebrations going on where you can gain even more chances of winning this awesome book and a Moda Precut! Its going to be a good hair day as that's what I'm getting done this afternoon!! I do follow and enjoy your blog. This says I'm the first comment. Seriously? That's never happened before! I am having a bad hair day so far because I have not showered and dressed yet. No work for me today, I am heading to a retreat on the Oregon Coast, I am so excited. I know I am going to love the new book. It is a great day--finally cooling off on Southern California. Love puppy chow! But we always call it people chow. ;-) Thanks for the chance to win some goodies! Oh! Liked your facebook page, too! I love Puppy Chow but can't make it often or I'll eat it all since I'm home all day long. Great choice. I really do think this book is a must have so hopefully I'll win so I can buy fabric with my money to use with the book. And I thought I was already following your blog on GFC but it said I wasn't. I am now however. Oddly, today I'm not having a bad hair day! Thanks for the chance to win some of your beautiful fabric. love the recipes everyone is choosing - such yummy treats to make. thanks! Today is an in-between hair day. Could be better, but could be a lot worse. I'm a new follower of your blog in reader too. Enjoyed your post. I'm having a good Friday...except for waiting for a plumber to show up! Thanks for the giveaway. Today is a bad hair day, so it is pulled back into a ponytail. I follow via Google Connect! I'm having a fairly good hair day. Thank you for the generous giveaway. Hahaha - no bad hair today - I'm off to the salon at 330p to get it dyed again - grays, AWAY! *zing* (magic!) lol. Trying to get away from distractions like chores so I can get to the sewing room! I too am tall and love aprons that cover top and bottom - I'm rather messy in the kitchen. Painting today--but wish I were sewing! It's my Birthday today. It's a milestone: 60. I am spending it here on Long Island with my favorite Brother and his family. The book looks great. Can't wait to see it. Thanks for a chance to win! HELLO! WE HAVE A LITTLE SNOW HERE TODAY IN THE ROCKY MTS! BEAUTIFUL-BUT MAYBE A LITTLE EARLY-OH WELL! IT WILL NOT LAST UNTIL NOON! The humidity has been awful here in North Carolina, so I've been having a bad hair week. Thanks for the giveaway. I liked you on Facebook. Thanks. I could complain about this long week, but I will refrain. Looking forward to sewing time! After DAYS of rain, we finally have some beautiful weather here in Eastern Pennsylvania. It is in the upper 70s today but the weather service is telling us that Sunday's high will only be in the mid-50s (!) and rainy. I think it is going to be an excellent weekend for sewing and snuggling under a couple of quilts! Thanks for the opportunity to win! This is so fun! Thanks for the chance to win - I LOVE all things MODA!! Funny, yesterday I had a GREAT hair day, but today, my hair is FRIZZY and uncooperative, so, yep, today is a BAD hair day!! I am now following your blog,and not just because of the bonus entry, but because you have a great blog! I look forward to reading it!! Fun, fun, fun! Actually, my hair is in a pony tail b/c it WAS a bad hair day!! Thanks for the chance to win! MMMMMMMMMMMmmmmmm. I LOVE Puppy Chow!! I haven't had that in years but now I want to make some!! Yummy! Would love to win a copy of the new book. It's not actually a bad hair day, but you never know how it will be at the end of the day. Today was a short day at school, so I get to sew befor hubby gets home! Thanks for the chance to win! - I love the layer cakes too! Puppy chow is a favorite at our house too! The first of my nieces and nephews graduates this year so I definitely need to start some celebration quilts! My hair is fine....for now. But I have to go out soon, and it's been POURING rain! LOL! Puppy Chow is SOOOOO Good! Puppy chow sounds really good! My grandson loves peanut butter! I love the cupcake picture! Cupcakes are a favorite of mine too. Everyday is a goo-hair day for me since I got it cut super short. Haha! That cupcake looks delicious. Makes me want to go bake some right now. Can't wait to try the Puppy Chow! Love all the Creations I have seen so far. How fun to learn about all the talented Chefs! I'm following your blog through google reader! After 2 weeks I am finally having a calm enjoyable day without too many activities. It is raining here, so my hair is very curly! :) Sometimes though, that can be a bad thing. Can't wait to see your graduation project in the book. Of course, I would need to win that fantastic book to see for myself and to get another idea to use the Moda layer cake you are giving away. Everyone wants to win and someone will be so happy. Thank you for participating and giving us all a chance to win. I just did my first secessful FMQ on a table runner. It is so-so work but I am happy with it. Thanks! 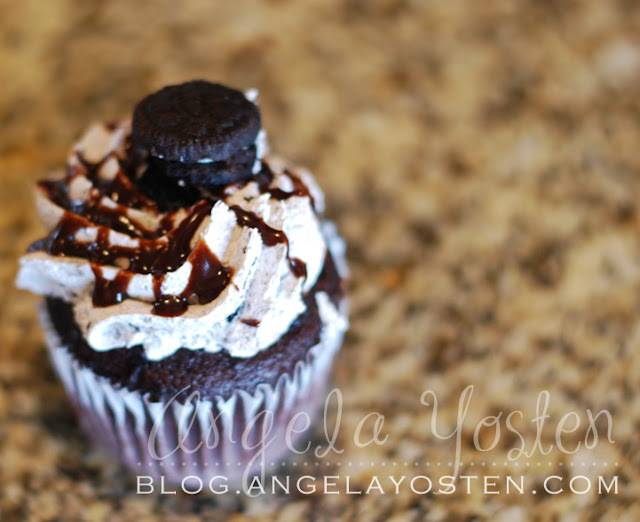 I'm hungry for a cupcake after reading your post! The puppy chow sounds yummy too. pretty much every day is a bad hair day around here. who cares? I just keep it chopped short & don't fuss with it much! Thanks for the giveaway! Such a great giveaway! Totally a hat day here! Cute kids! I'm off to get my flu shot - yuck but necessary. My kids set me up with a facebook page, no idea how to like or do anything on it...or now that I think about it - How do I find it? :) Liking your page will give me an excuse to call one of them this weekend for instructions on how to do it, like a mom ever needs an excuse to call! Now that I'm retired, my hair is usually in a ponytail unless we are going out to dinner or a special event, then I blow dry it. Enjoyed your blog. Puppy Chow rang a bell for me from the past. Thanks for a fun blog entry. How's this for what's happening? We got our first snow of the season today! Time to quilt! No bad hair day today! Just thankful for some cooler weather - makes it seem more like October here in Oklahoma! having a bad hair day, but that had better change....i'm going to my first SU football game tonight!! I so need to get my hair cut, or a new pair of straighteners! That puppy chow sounds delicious! Perhaps I'll try it for my daughters birthday next week. i just liked you on facebook (although i think i liked you even before that)!! It's so windy out today, that everyone has bad hair, but I got to see my one week old grandson, so I don't care what my hair looks like. Love that puppy chow! Thanks for the reminder about it......also thanks for the chance to win the book. It looks terrific!! My college roommates introduced me to Puppy Chow more than a decade ago, and I'd forgotten all about it until I needed a snack to bring for a weekend trip -- perfect to enjoy AND share! I am looking forward to making your recipe. Sounds like a great snack. I can't wait to see the book, too. Thanks! Oh, and my hair is okay today. Low humidity and curly hair do well together. Thanks for asking, lol. I love puppy chow! Thanks for the recipe and the giveaway!!! We already liked you on FB as Margaret W.
And I followed your blog. Should have a long time ago! Thanks again!! Thank you for the recipe, and 3x chances to win! I would like at this point to add that I now follow your blog via google+ and email, as well as have liked your facebook page! I may just have to check out your pinterest as well! Thanks! I do follow your blog. Happily, I might add. I love the apron and the recipe looks yummy! Don't get me started on "bad hair". I had lovely hair. Honestly, it was thick and wavy and could be coaxed into allover curls with a little product and some hand squishing. And then I lost it all to chemo and what came back is more like a brillo pad and very thin in places. Too much hair now to make a wig comfortable and too little to slip under the radar of "normalcy". Alas. At least I'm alive. Like I said, don't get me started on hair. Looking forward to trying your recipe and seeing more projects from the new book! Thanks for the giveaway! P.S. I can't complain about my hair because I'm happy just to have some! Like Heather, I lost mine to chemo too...it's grown in past the poodle stage, but us post chemo girls need a hair support group or something! Never heard of that recipe, but it really looks good! Puppy chow is a favorite at my house too! Love the new book! I just want to say that I have had that puppy chow before (someone at my work brought it in) and it is AMAZING! Thanks for posting the recipe! 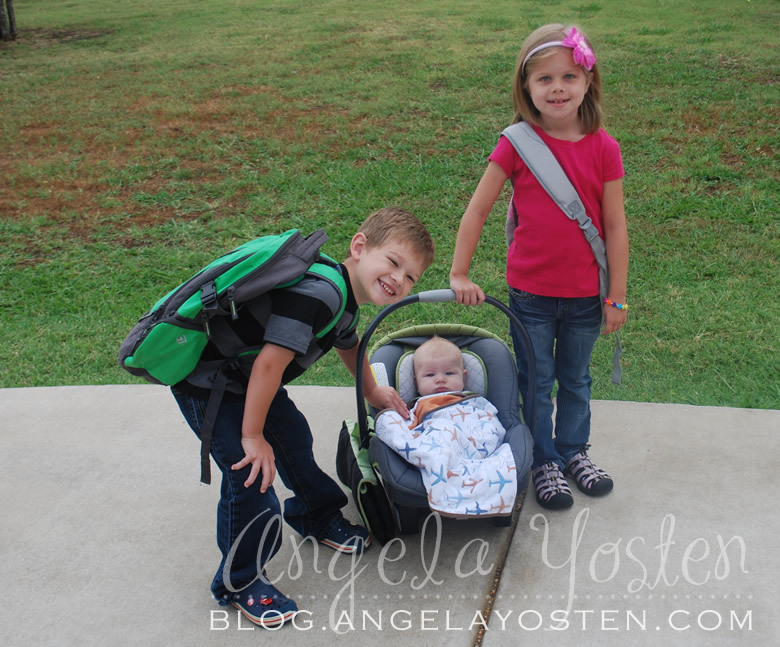 This fun blog hop is really brightening up a rainy, gloomy day. Puppy chow is the best! Thanks for sharing, and for the chance to win! Today has been a good day--it's cooling down in California!! I have a quilt top pieced for my granddaughter and looking thru books to get a creative idea for the backing. Thanks for the chance to win a copy of the book or the Layer Cake. I agree that the layer cake is the best pre-cut for the different shapes available. Thanks to Moda for introducing me to your blog. Excited for the book! Thanks for the chance to win. I WAS having a bad hair day but got that fixed up with a great haircut today!! It would make for an incredible day to win!!! 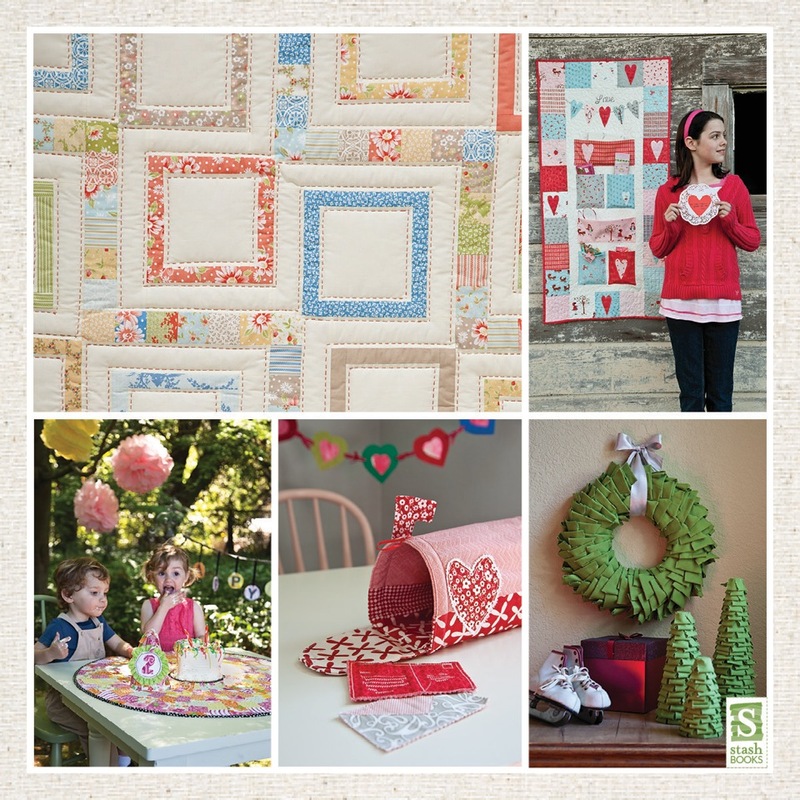 I won Fresh Fabric Treats from you and I love looking at all the beautiful projects. Haven't done one yet because I've made some pillows to practice quilting and then jumped into making a homecoming dress and now 11 costumes for a high school play. Soon though I promise - I love it. Thanks for the chance! I've been following you on Facebook for quite a while now. Your son is getting so big! Thanks for the bonus of winning the book! I follow you through my RSS Feed. Every morning with my coffee I check my favorite blogs and what they've been up with you being one of them. Thanks for the chance. I always have bad hair days but somehow with age I've learned to embrace my unruly hair! Terrific giveaway! and finally I now follow your blog via email. Terrific giveaway! Thanks for the chance to win. 1. I have to say I'm liking my hair today. I just got a whole bunch cut off yesterday. LOve your blog. 2 I went, I saw, I 'liked', I want. LOL This in reguards to facebook. 3. I'm a new happy and lucky follower of your blog. Well I hope it is lucky anyway. I am having a good day, because the work day is over and I get a long weekend with the family! I am really curious to read your cupcake eating technique, lol! This book looks great. Discovering new blogs is an added bonus. I've had a great day! Thanks for the giveaway! It's the college's fall break. I got a jump start on my spring lesson plans - now I'm ready to sew this weekend starting with our bee meeting on Saturday! I'll share your website with them. Having a great Friday, ready for the weekend. I will definitely check back on Monday to find out about the cupcake eating business. Thanks for the chance to win. I saw my first snowflakes of the season today...I'm not ready for that! Thanks for the chance at your giveaway. Has to be a good day! its Friday! and that means sewing this weekend. Yeah! thanks. I have to celebrate good hair days, instead of worrying about bad hair days. LOL Thanks for sharing your pretty cupcake!!! Love your blog and will be continuing to follow. Every day you get up is a great day, and should be enjoyed.Today I spent rummaging through my stash(es) for fabic to make 2.5 and 1.5 strips for a modern quilt project. Puppy chow is a big favorite at our house! My husband said, "Only you can take a perfectly healthy cereal and turn it into junk food!!" I just saw a white chocolate version of Puppy Chow called White Trash I thought it was a riot! I spent the day fabric shopping - but not for quilts. Each year I make Halloween costumes for my three grandchildren, ages 6, 4 and 2 1/2. They just couldn't decide what they wanted to be so my daughter said to surprise them! No pressure on grandma! But I found everything I needed and I hope to be creating three great costumes that they will love. I'm intrigued with your special cupcake eating technique, I'll be very well informed/equipped the next time I have a cupcake! I am having a bad eating day. Too many sweets, cuz it's my Birthday! My hair was good enough for babysitting the grands!!! Loving this blog hop!!! HA! My hair day could be better, could be worse! How about you? I am anxious to see your graduation contribution to the book. Good hair day today. Mostly. Thanks for the giveaway! ooohhhhh....bad hair day today! Just can't get it right. Thanks for the give away. It'll make up for the BHD if I win. now that you mention it, i do have a bad hair day ... we've been having a series of stormy fall days with flooding and all for a month, and i haven't been out for a haircut... sigh. but i can whip up a delight snack of puppy chow to help me wait for a decent day to go out. thanx to you! I liked your facebook page, I mean, I like your facebook page. Your little boy is precious and the lacy quilt in his background is great! I did a double take to see if there was really lace attached. LOL Silly me. I'm sorry but I don't do Facebook. But if I did I would like your facebook page. I follow your blog and enjoy reading it. I'm looking forward to this three day weekend but then most of all I'm looking forward to Tuesday. My husband and I will be celebrating our 30th wedding anniversary. Yippee!! Thank you for your recipe and for the chance to win. My husband and daughter left for a football game out of town and I have about 30 hours to myself- sewing room, here I come. My husband went to the mountains for one last fishing trip and I am going to have spare time to SEW! I do miss him though. I just signed up to follow your blog. Am excited to check it out and see what ideas you share with us. I went over to Fb and pushed like and left you a short comment. Thank you. Loved hearing about you and yours. Thanks for a chance to win the book, which I believe will be delicious and the layer cake, love layer cakes! I helped take care of my niece's three month old triplets today. sweetness. I'm looking forward to sleeping in tomorrow and for a quiet family day! yum-that is one of my favorite recipes! I make it with soy butter since my dd has a peanut allergy and it's just as tasty. Okay I am intrigued by how you eat your cupcakes you can be sure I will be checking back on Monday. That cupcake looks yummy! The book looks like so much fun! I'm a new follower. YAY!!! Your pupy chow made me laugh, it really looks like dog food! I think I will wait for Monday ( cupcake day). I can't get moving this morning so looking for a little pick me up in blogland and now I've found it! Congrats on the book - I love the first one, and thanks for the giveaway! Good morning from Louisiana...thanks for being so generous. I have become your follower...looking forward to reading your posts. ooh, puppy chow is dangerous! I could eat the whole batch myself! Your 'Puppy Chow' looks like it should have the international 'NO' sign on it -- but who cares! Thanks for sharing. I'm a follower - and it is colder than anything here - 46 in the morning - and I am in the South! Have a warm and wonderful day.